Although there’s some distance between the emergence of crossbows and compound bows, the debate ‘crossbows vs compound bows’ is still on the air. Both have their bright and dark sides. So, both have followers and critics. In fact, crossbow isn’t any good or bad than a compound bow. It’s the just the matter of your preferences. A compound bow may not work where a crossbow performs best. The same may happen to a cross bow. So, what should you get? In this article, I’ve presented you a comparative and contrasting study on both bows to help you get along with the right crossbow or an advanced compound bow. You might be wondering which bow is better to get an excellent day out in the wilderness. A hunting enthusiast would carry thorough research before deciding to choose a bow. We have this part covered for you. 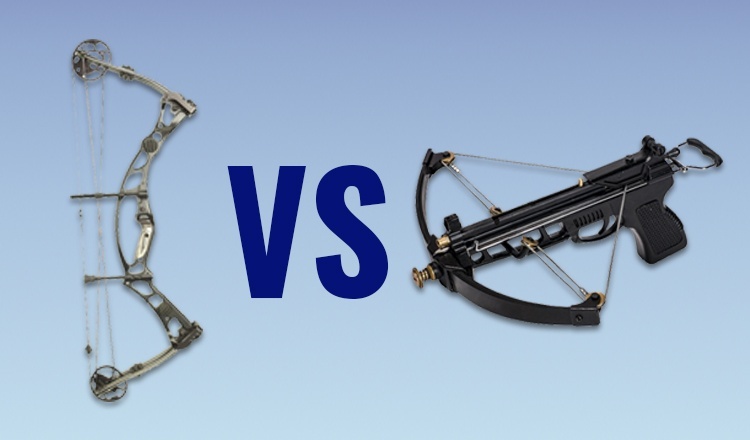 Read the following discussion to get an in-depth insight into the contrast and comparison of Crossbows vs Compound Bows. Both bows are designed with particular components that contribute to their design, accuracy, speed, durability, and overall performance. But these bows differ much as you look at their components which are not very similar to each other. A crossbow consists of a riser, stock, Sight Bridge, limbs, latch, flight groove, cocking stirrup, barrel, arrow retention spring mainly. A compound bow consists of a riser, limbs, cams, cam systems, bowstring, cables, cable guard, cable slide, arrow rest, peep sight, sight, string vibration arrester, and a stabilizer. Each element of a bow serves a distinctive purpose. There are two common types of crossbows – the compound crossbow and recurve crossbow. Most of the components are the same in both bows having a subtle difference. The basic parts of a crossbow are as follows. A compound bow runs conforming to a more complex mechanism. There are a few moving parts involved unlike other types of bows. If you are a newbie in the realm of archery, be watchful while using a compound crossbow. Let’s get a walkthrough of the components of a compound bow. Factors that matter most in archery include speed, draw and (draw) weight, noise, size, mass weight, accuracy. All these factors determine the quality of a bow. Crossbows and compound bows also differ from each other in terms of these factors. The energy and speed of a bow depend on the draw weight and the power stroke. If you want to get the maximum speed and energy from your bows, you have to shoot the arrow after reaching to the highest draw weight and pull the string to such a point so that the distance equals the power stroke. The combination of perfect draw weight and draw length can produce the best energy and speed for both compound and crossbows. A bow needs a minimum weight to be drawn flawlessly. Less draw weight will cause the bow to shoot the arrows at a low speed. You should apply the maximum amount of force to reach the maximum draw weight because a bow becomes fully drawn only if the draw weight hits the optimum mark. Crossbows yields more draw weight. With shorter power stroke, they generate more speed than compound bows. You have to pull the string of the bow to a certain distance to store energy. Power stroke refers to the distance a bowstring travels in between the full draw and rest position. The longer the power stroke, the faster the arrow will fly. The draw length of a compound bow is easy to lengthen whereas it’s difficult to lengthen the draw length of a crossbow. So, a compound bow is the better of the two in this regard. Excess poundage of a crossbow allows it to shoot faster arrows, but that positive side is associated with a negative effect. Using a crossbow often is troublesome for the high poundage and weak and injured people face difficulty while shooting with a crossbow. Besides, it needs more time to draw, lock and shoot. This isn’t convenient for a hunting enthusiast. You have to do it really quick in a wild environment. In terms of usability, I take the compound bow as a winner. Crossbows are a bit smaller than compound bows. Though compound bows are large in size, they are not cumbersome to carry through the woods. Crossbows can’t do much good to a hunter being shorter than compound bows because they are heavy and hard to deal with in outdoor situations. Due to this excessive weight, people tend to use compound bows for hunting situations. A crossbow creates more sound than a compound bow because the crossbows have high poundage and manual mechanism that causes more vibration and sound. A compound bow is a relatively new invention with advanced shooting mechanism compromising cams, cables, string vibration arrester, and stabilizer, etc. These few parts all together ensure that the compound produce little vibration and noise. A bow that produces the least vibration and noise is the one you want while in the wood. A compound bow can give you great accuracy. It has a constant anchor point and a more developed mechanism to back the accuracy feature. The crossbows have a latch that holds the string until the you pull off the trigger. But in this case, the consistent string position gets compromised sometimes. As a result, you will get less accuracy compared to that of a compound bow. The price of the bows depends on the built quality, material, usability and brand of the bows. I recommend my friends and readers to look for a bow (both crossbow and compound) that comes at a midrange budget. I don’t recommend spending a lot of bucks on the bow. Crossbows and compound bows both have some legal obligations to conform to. The user must be above 14 years old and have a license to use bows for hunting. You shouldn’t enter a private property without the permission of the landowner. You shouldn’t shoot with crossbows within 250 meters of any home, school, playground, etc. Some states allow a crossbow only in archery season. Most of the states of the USA allow compound bows. Only two states, Montana and South Dakota State don’t allow a compound bow any less than 28 inches as measured from top to bottom. So, you can easily go on hunting keeping these rules and regulations in mind. Know the rules and regulations of your hunting place before it entraps you in trouble. Regardless of the type of bows, you have to maintain the bow to get the most of it. A bow will not last long without proper maintenance. Crossbows are prone to damage. The strings, cables and other parts often need to be replaced and repaired. On the contrary, a compound bow hardly needs any replacement or repair. Crossbow and compound bows will not last any longer than two years if you leave them with little/without care. The following maintenance tips will keep your bows in a good shape for a prolonged period while delivering accuracy. Figure out the exact draw weight and draw length that fit your bow. Inspect the bow after and before every shot. Check the riser, handle, safety, bowstring, etc. sensitive parts. Store the bow properly. Clean the bows and keep them in a dedicated case if possible. If you aren’t an expert, consult an expert for annual inspection. Never dry fire your bow. Firing the bow without an arrow or bolt puts all the pressure and tension on the string and may damage it. Choose a compatible bow as per your strength, styles and body structure. So, crossbow or compound bows? Again this question! I can’t answer it directly. Moreover, I shouldn’t, without knowing your archery skills, and age. The above discussion should help you. However, I’m also available for helping you with any question regarding this topic. Happy bow hunting!